Hi, I’m Kat! I created KaperCrochet to share my patterns and projects with the world, and to hopefully inspire others to give crochet and amigurumi a try. Amigurumi is the Japanese art of crocheting or knitting stuffed toys, and it was the very first technique I learned. Eventually I decided to give patience a chance and branched out into crocheted clothing and accessories too! I started writing crochet patterns in 2012, the very same year I learned to crochet. The urge to create new, fun designs that anyone could achieve was irresistible! I’ve been designing new patterns ever since. My goal is to create designs that are recognizable, simple, and adorable. In 2017 I found a renewed love of knitting as well, and I released my first knitwear design in 2019. My knitting designs are my autobiography. They’re chock full of nostalgia and mostly inspired by precious memories and stories from my past. 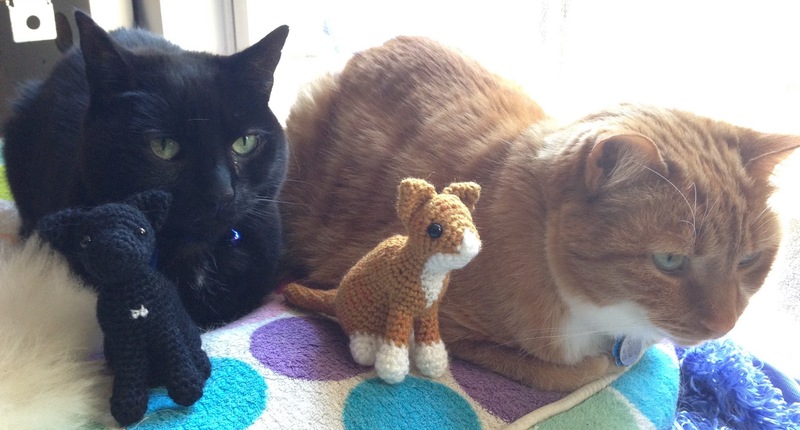 I currently live in the Washington D.C. area with my two goofy cats, seen here with their crochet counterparts. Cat pattern from PlanetJune, found here. You can also find me on Ravelry here! You are welcome to sell items made from my patterns, but I would really appreciate if you give me credit as the designer when you do so. This can be a note on your online listing or a line on a tag and/or info sheet if you’re selling offline. Likewise, for any free patterns on the site, you are welcome to share them, but please link out to my site and give me credit as the designer when you do so. If you purchase a pattern, you may not post, sell, or otherwise share the pattern itself, but see the above note about finished items you make using the pattern.